This duo is designed at helping you fight against oxidation and ageing for beautiful, radiant and healthy looking hair and skin. 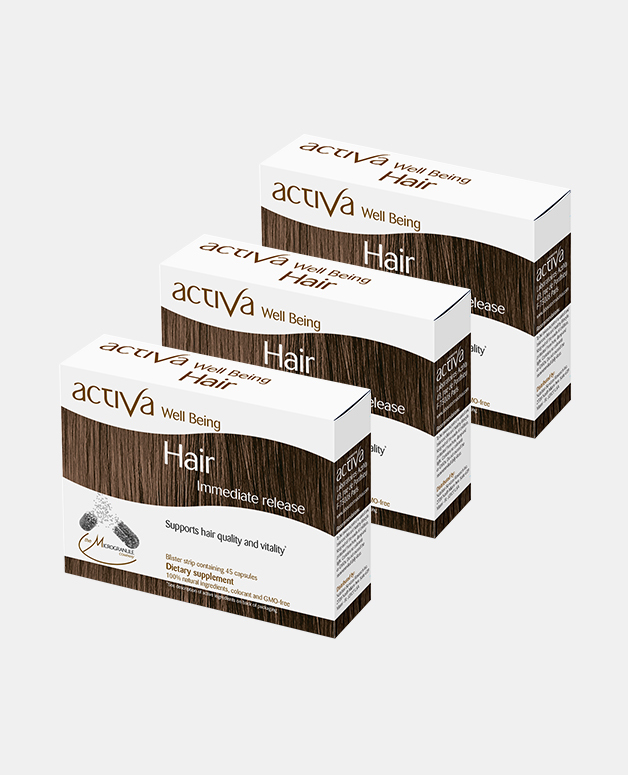 Activa Well Being Hair is here to help you fight hair loss, stimulate growth of existing and new hair and improve hair quality & vitality naturally. 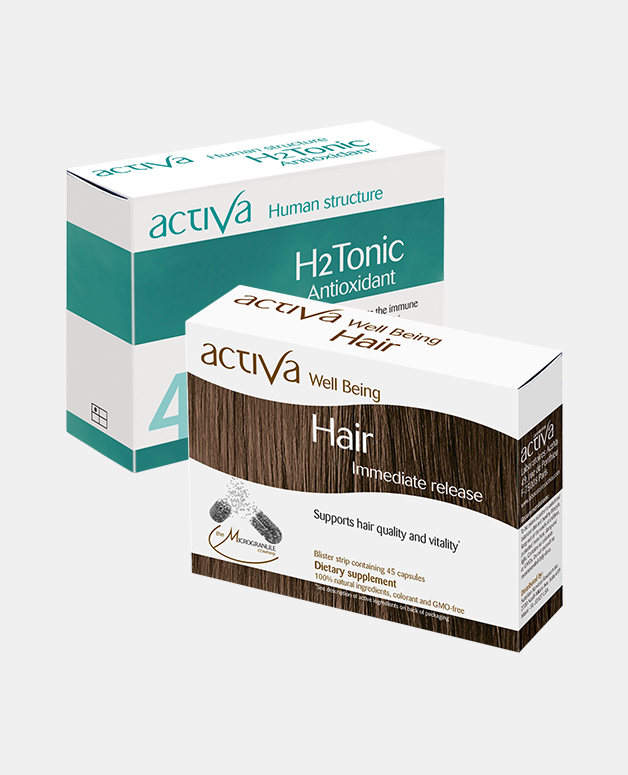 Activa Human Structure H2 Tonic contains a blend of totally biocompatible antioxidants, amino acids and trace elements whose combined activities fight free radicals. It has been designed to help the body boost its innate antioxidant potential. Activa Human Structure H2 Tonic main nutrients are one of our primary sources of energy and ensure cell’s health. Faced to free radicals, cells can be damaged. Pollution, smoking alcohol, stress, electromagnetic waves, UV rays and dieting, all encourage release of free radicals which can cause a broad spectrum of damages in the body (ageing, malfunction, low immunity, etc…). It is called: oxidative stress. That’s why antioxidants are important to keep healthy cells and balance of the main constituents of our body. Blackcurrant: The vitamin C combined with the anthocyanin reinforce capillary’s resistance and permeability. Amino Acid: Glutamic Acid for body’s detoxification and protects cell’s integrity against free radicals (most powerful antioxidant). Histidine and Threonine in order to bring SOD in the cells. To be taken as part of a balanced and varied diet combined with a healthy lifestyle. Keep out of the reach of children, protected from heat, damp and light. These statements have not been evaluated by the Food and Drug Administration. This product is not intended to diagnose, treat, cure or prevent any disease. It is necessary to consult your medical practitioner to evaluate your health condition and requirements. Anti-oxidants (lutein-rich Tagete extract and extracts of Watercress & Bilberry) help regeneration of hair and healthy scalp.